Ten years after the establishment of Lincoln Park, four years after the Chicago Fire, and at a time when the disinterments were presumed to have been completed, there remained cemetery headstones in Lincoln Park, marking graves of individuals who had not been claimed for reinterment elsewhere. Wanting to complete the transition of the cemetery into the park grounds, the Lincoln Park Commissioners moved the scattered marked graves to a separate fenced location within the park. A few years later that Cemetery in the Park was itself incorporated into the park grounds by removing the above-ground evidence. 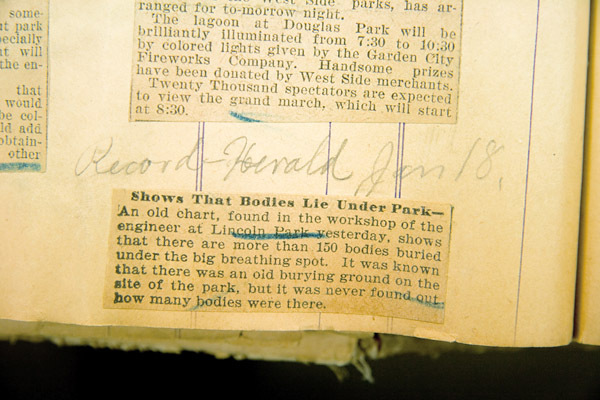 Twenty years later, a park engineer discovered a map detailing the burials from that area. By that time nobody seemed to remember this earlier park feature. 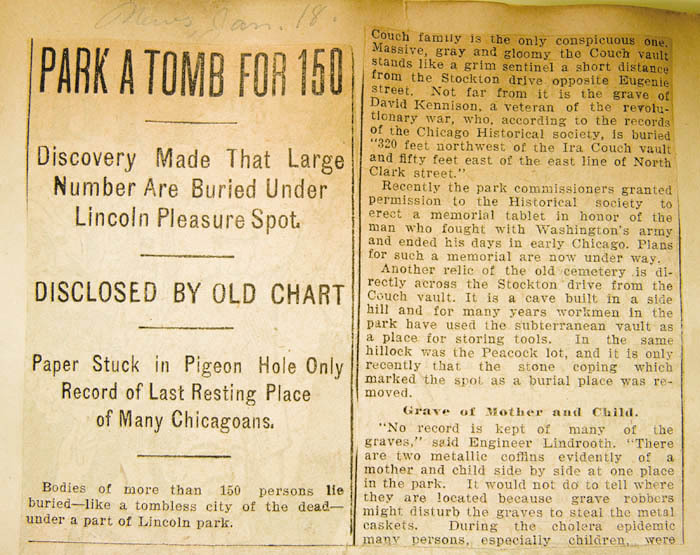 Bodies of more than 150 persons lie buried – like a tombless city of the dead – under a part of Lincoln park. Discovery of this fact, hitherto a subject largely of speculation, was made to-day when an old chart was found in the workshop of a park engineer. The bodies have never been removed since the time the site between Wisconsin street and North avenue east of North Clark street was used as a city cemetery. Unmarked by a headstone, not mentioned in official records and unknown to the thousands of persons who frequent the spot, 145 of the bodies lie clustered together at the north end of the baseball field, 130 by 200 feet in dimensions. Scattered throughout the southern part of the park six other bodies, perhaps many more, lie beneath the lawns and tennis courts. In a pigeon hole in the workshop where hundreds of maps, blue prints and drafts are put away year after year the old chart in pencil was found. It had remained undisturbed for years, while the lapse of a quarter of a century obliterated the history of the remnant of the old cemetery which still exists where the romping feet of children tread, where picnic parties hold revelry and where lovers keep their trysts. J.H. Lindrooth, civil engineer, who has been connected with the engineering department of Lincoln park continuously since 1869, is the owner of the only record of the location and names of those who are still buried there. The document was drawn by him in 1875. After most of the bodies in the old graveyard had been removed to Graceland, Rosehill, Calvary and the Jewish cemetery, under condemnation of the land for park purposes, the bodies remaining, so far as they could be located, were exhumed and reburied in a more compact space, where they now are. The old chart bears the names of the occupants of the burial lots from which the bodies were taken. One of the names is that of “Winfield Scott Lee.” It also shows, by the annotation scratched in the margin, that there were 132 tombstones and seventeen identification tablets. What has become of the tombstones is a mystery. They have totally disappeared from the park. For years granite slabs bearing inscriptions and quaint verses, dated in the early days of Chicago’s existence, were familiar sights to frequenters of the park and as late as the ‘90s nearly a score of them were used in building a rude waterfall that served as an outlet to the south artificial pond, near the Grant monument. They had been moved away from the new cemetery spot which is opposite Menomonee street. Afterward they were replaced by concrete. Some of the heavy stones appeared from time to time at points further north and finally found a resting place in the rear of the barn at Fullerton avenue, where they were allowed to lean ignominiously against a high board fence until a new barn was built several years ago. Then the old stones disappeared. Recently the park commissioners granted permission to the Historical society to erect a memorial tablet in honor of the man who fought with Washington’s army and ended his days in early Chicago. Plans for a memorial are now under way. Another relic of the old cemetery is directly across the Stockton drive form the Couch vault. It is a cave built in a side hill and for many years workmen in the park have used the subterranean vault as a place for storing tools. In the same hillock was the Peacock lot, and it is only recently that the stone coping which marked the spot as a burial place was removed. Go here to see my unsubstantiated theory of what happened to the tombstones mentioned in the article, above.